Perennial. 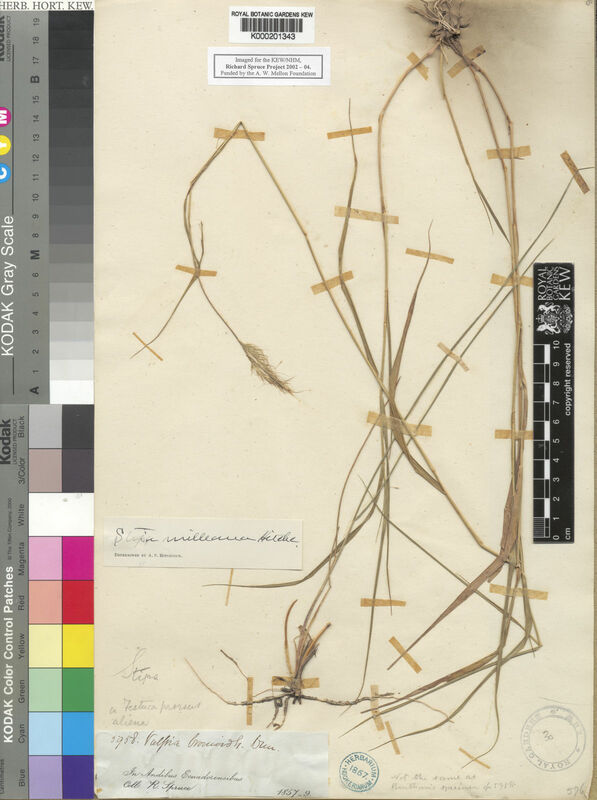 Culms erect; 50-100 cm long; 3-6 -noded. Culm-internodes distally pubescent. Leaf-sheaths smooth, or retrorsely scabrous. Ligule an eciliate membrane; 0.5-1 mm long. Collar pubescent. Leaf-blades 30-40 cm long; 4-8 mm wide. Leaf-blade surface puberulous; hairy adaxially. Leaf-blade apex attenuate. Inflorescence a panicle. Panicle open; lanceolate; interrupted; dense; 20-40 cm long. 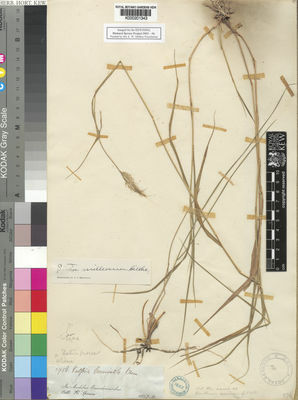 Primary panicle branches appressed, or ascending; 2-5 cm long. Panicle axis smooth. Spikelets solitary. Fertile spikelets pedicelled. Pedicels scabrous. Spikelets comprising 1 fertile florets; without rhachilla extension. Spikelets lanceolate; subterete; 6 mm long; breaking up at maturity; disarticulating below each fertile floret. Floret callus brief; 0.3 mm long; obtuse. Glumes persistent; similar; exceeding apex of florets; thinner than fertile lemma. Lower glume lanceolate; 1 length of upper glume; membranous; without keels; 3 -veined. Lower glume primary vein scaberulous. Lower glume apex setaceously attenuate. Upper glume lanceolate; 6 mm long; membranous; without keels; 3 -veined. Upper glume primary vein scaberulous. Upper glume apex setaceously attenuate. Fertile lemma elliptic; subterete; 2 mm long; coriaceous; mid-green, or light brown; without keel; 5 -veined. Lemma surface pilose. Lemma margins convolute; covering most of palea. Lemma hairs 1 mm long. Lemma apex surmounted by a ring of hairs; with this appendage 2-3 mm long; awned; 1 -awned. Principal lemma awn geniculate; 10-13 mm long overall; with twisted column. Palea 2 -veined; without keels. Lodicules 3. Anthers 3. Stigmas 2. Ovary glabrous. Caryopsis with adherent pericarp; fusiform. Hilum linear.